Senator Tito Sotto may have chosen the wrong words just to break the ice in the confirmation hearing of Social Welfare Secretary Judy Taguiwalo. 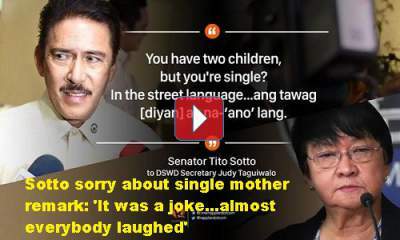 In fairness to Senator Sotto, he has said sorry for the single parent joke and Taguiwalo herself accepted it and urge people not to make a big deal out it. Not unless dirty-mindedness already takes over social graces. [VIDEO]: Single mothers are “na-ano lang” (just got knocked up). Tito Sotto made this remark as he grilled DSWD Secretary Judy Taguiwalo, a solo parent, during her confirmation hearing. One can only be offended by Sotto’s remark if he or she allows himself or herself to give a dirty meaning on what Sotto said. He said in Tagalog referring to the status of Taguiwalo as a solo parent; Na-ano lang! Which means; Just got ____. “Ano” is a blank word – but many assume it as “just got laid” or sexed up. This is why despite the apology, most people just can’t get over it. It might be inappropriate for the senator to utter those words in that particular setting – but detractors should know where he’s coming from. Despite his high status in society, he remains close to the masses. In Eat Bulaga during their “Kalye Serye” portion, they are inclined to merge with real people from different communities. This is just a bit of his routine. Even if he is in Cebu, his family’s hometown, he is definitely a community-oriented person. It is not surprising that he can forget where he is and speak the street language because it is already part of his normal life. If what he said is analyzed with an open mind, it is not offensive. What if he meant, just annulled, just widowed, or just decided to be a solo parent then, shame on to his accusers. The charges will not even stand in court for libel or to humiliate someone, let alone a single parent by choice like what his daughter, Ciara decided to be after separating from her husband who allegedly cheated on her. Sotto never called anyone names – but his detractors are calling him names that hurt not only his children but people who know him well. Sharon Cuneta now Pangilinan, his niece even apologized on his behalf who was once a single parent after she separates from her first husband, Gabby Concepcion. This should already assure everyone that Sotto does not mean any harm to single parents.